It’s known in our catalog as item No. 4109, but many numbers go into the making of our Easter Centerpiece. There’s 10, the number of baker fern. Seven lavender daisy pompons. And five heads of purple statice. Of course, it wouldn’t be Easter without four glitter eggs, in addition to the arrangement’s other elements. The accompanying photos show one of our central design teams handcrafting the Easter Centerpiece, no doubt making one just for you! 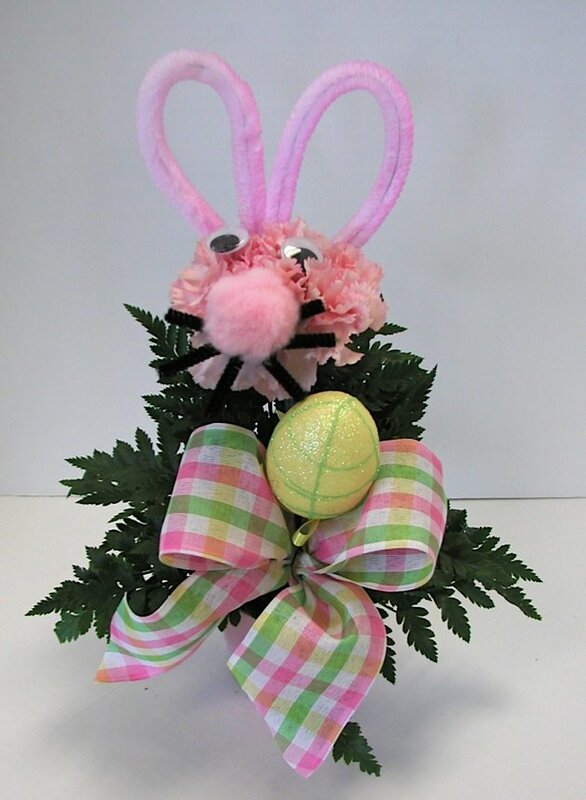 To order an Easter Centerpiece for yourself or to send to someone else, please click here. With spring and Easter fast upon us, our central design department is hopping to it. This team was hand-crafting our Mixed Spring Garden, which includes a three-bloom hyacinth, mum, tulip, birch branch and silk forsythia bush. Royer’s stores will be hoppin’ on March 12. An egg-cellent time is sure to be had by all. The Royer’s Kids Club is getting a head start on the Easter Bunny with a free event in all Royer’s stores. Children ages 5 to 12 will have an opportunity to make a special Easter arrangement and will receive a balloon. Fox 43 Morning News’ Amy Lutz and Royer’s Barry Spengler. It was another egg-cellent visit to Fox 43 Morning News for Barry Spengler, our vice president of operations. 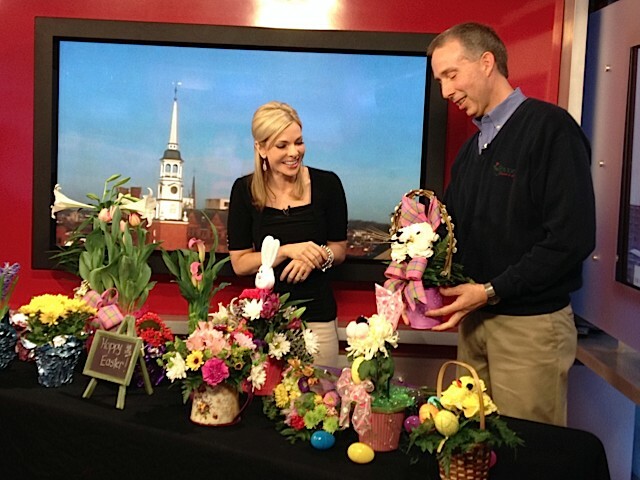 He joined host Amy Lutz to discuss spring and Easter flowers and plants. 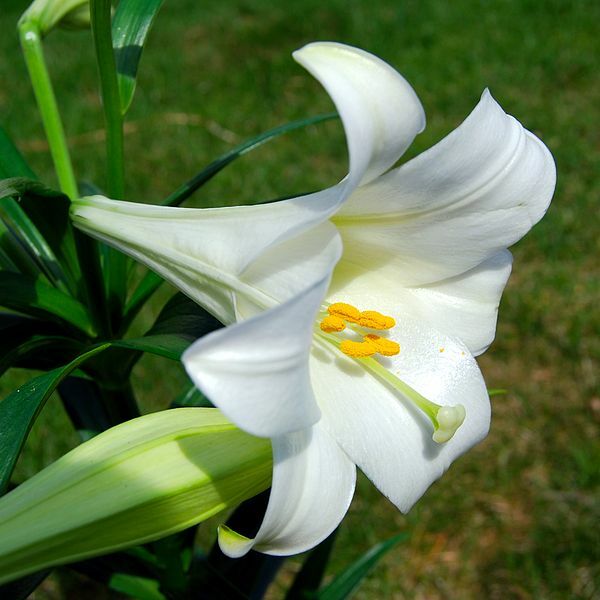 Easter lilies and calla lilies offer a nice fragrance and can be planted outside but should be kept in a protected area, such as near your home. With bulb plants, once their blooms are “shot,” let the foliage die back into the bulb. This will provide nutrients that will strengthen the bulb. “Over the summer, you can just let that dry in the pot, plant it in the fall, and you’ll see them next year,” Barry said. Spring and Easter are on full display in our stores, as evidenced by these photos from our Hershey location. Easter fun is just a hop, skip and jump away for Royer’s Kids Club participants. On March 14, children ages 5 to 12 will have an opportunity to create a carnation bunny, complete with greens, an egg-and-ribbon stick-in, and pipe cleaners (for ears). Time slots are available at 10 a.m., 2 p.m. and 3 p.m. at all of our 16 stores in Berks, Cumberland, Dauphin, Lancaster, Lebanon and York counties. Admission is free but registration is required by calling your nearest store. Click here for locations and contact information. Even after the Easter Bunny has visited and the last eggs are hunted, Easter plants will bring beauty and color into your home. In fact, you can make the flowers last a lot longer by following some easy steps. What’s more, after your bulb plants – such as daffodils, hyacinths, tulips, crocus and narcissus – have finished blooming, you can transplant the bulbs into the ground and watch the flowers come up next year. The key to making the flowers/blooms last longer – perhaps twice as long – is to keep the plants in a cool place, such as at night. This will stall the normal aging process, extending the life of the blooms. While you’re sleeping, place the plants in your garage or out on your porch (but don’t let them freeze), and then bring them back inside your house in the morning. For smaller plants, such as a single-bloom hyacinth, you might even have room in your refrigerator. Of course, it’s also important to keep the plants watered. Once the blooms peak, let the plant die back into itself, nourishing the bulb. Keep the bulb in its pot and store in a cool, dark place. In early fall, separate the bulbs and plant them in your garden in anticipation of their blooming again next spring.